Today we welcome back Etta Brown, author of the helpful parenting guide, Learning Disabilities: Understanding the Problem and Managing the Challenges. We hosted Etta at the beginning of the month and have asked her back to discuss one of the important topics from her book: nutrition and learning disabilities. Welcome back to The Book Connection, Etta. It’s a pleasure to have this chance to hear more about your book. As a reminder to our readers, can you tell us a bit about yourself and your book Learning Disabilities: Understanding the Problem and Managing the Challenges? The book is in response to the Federal law entitled No Child Left Behind which delegates to parents the responsibility for appropriate education of learning disabled and other exceptional children. This law empowers parents with rights that supersede those of the school. The problem is that parents are not prepared with the knowledge or experience needed to be successful at monitoring the special education process and designing an Individual Educational Plan for their child. Learning Disabilities: Understanding the Problem and Managing the Challenges is a retired School Psychologist’s effort to meet the need for empowered parents prepared for the business of answering the question, “Is special education necessary, even if the child is eligible?” The law states that education should occur in the least restrictive environment. The least restrictive environment is the general education classroom with needed assistance. There are many dynamics that occur in the education environment that necessitates on occasion that this does not always occur. This manual empowers parents with an insider’s view of special education, and prepares them for meetings with a list of what to do, when to do it, what to say and when to say it, and what to do if they don’t get the right answer. In addition to all this, the book explains environmental factors that cause interference with the development of the central nervous system in the developing child, and how to identify and remove these factors from their child’s environment so that he experiences normal neurological development. Lastly, the book provides modifications and strategies for helping the child at home and school. The objective is to prepare parents to become a co-participant in the educational process by supporting at home what the teacher is asked to do in the classroom. Having read this book, I can tell you I wish it was available a couple of years ago when I began navigating the waters of getting my daughter assessed and an Individualized Education Plan (IEP) put in place. What made you decide to write it? After assessing hundreds of children, and participating in the development of their IEP, I retired with the memory of so many unfortunate children and their frustrated parents whose needs were not being met by public education as it is currently organized. As a classroom teacher turned School Psychologist, I had an insight into the needs of children which one gains by being a classroom teacher. Reading about the learning problems of children is not the same as one-on-one contact with children in the classroom. Friends after listening to me rank about children and learning often commented, “You should write a book.” After retirement, I got out of bed one morning and said, I think I’ll write that book today. I began writing about something that I knew something about. When I finished the book and began editing for grammatical errors, I realized that I had been doing therapeutic writing, venting all the frustration about the things parents needed to know about their children, but would be a disadvantage to the schools, so the schools didn’t tell them. I edited and reedited the book until all the anger was gone, then began to research and share all the things that I could now share with parents without being disloyal to my employers. By the end of the third year, I had compiled a manual of helpful information that would empower parents to take an active role in the special education process. Let’s move into the meat of our interview because I want to focus on some of the information you bring up in Chapter 6 about nutrition and learning disabilities. On Page 36 it says, “It may be accurate to say that the diet of most American children today is a diet that automatically results in a very low level of intelligence.” Why might that be true? The US Department of Agriculture states that only 2% of children in the US actually meet the recommendations of the Food Guide Pyramid, resulting in a lack of sufficient nutrients to build a healthy brain and nervous system in 98% of our children. Making matters worse, most children simply do not eat enough of the critical elements needed to build and maintain the brain from infancy. As the brain develops it needs first gamma linolenic acid an essential fatty acid found in abundance in human breast milk, but entirely missing from cow’s milk or soy substitutes. Clinical studies have shown that babies weaned on cow’s milk score lower on intelligence tests than those weaned on human breast milk. This presents a very potent case in favor of breastfeeding. The brain is composed of billions of neurons, or nerve cells. The more brain cells the child has, the more intelligent he is because he has a greater capacity to think and problem solve. With malnutrition restricting the availability of the nutrients needed to build neurons, fewer neurons are built. Severe cases of malnutrition result in severe mental deficiencies. A diet that provides moderate nutrients for brain development will result in moderate intelligence. There are very often other factors involved, however, and in the book 7 other conditions effecting the development of the brain and central nervous system are discussed, and they are all equally important to the development of the learning mechanisms of the brain. Isn’t this surprising news in a world where Americans are living longer and exercise and good nutrition are pushed harder than ever before? In the US government, there are two very important but mutually exclusive groups known as the Department of Agriculture and the Food and Drug Administration. The DOA researches and publishes the Food Pyramid telling people all the good foods they should be eating, and the FDA grants permission to put the very additives into our food that the DEA tells us is not good for us. Over the years the Department of Agriculture has increased its efforts to get the people to engage in a healthier diet and life style, while the Food and Drug Administration approves more dangerous drugs and chemical food additives that are killing adults and causing brain deformities in our children. Just for fun, listen to all the side effects added as a disclaimer on drug commercials. The side effects far out weigh any benefits gained from some drugs. While they tell us all the things that comprise the food products offered for sale, it would be more beneficial to the public if they just didn’t permit companies to put those harmful chemicals into the food supply. If the FDA were to state suddenly, we will only permit pure nature ingredients into our food, the incidence of learning disabilities would significantly decrease. The book also discusses hypoglycemia. How much impact does sugar and carbonated beverages have on brain function? The body needs fuel to work. One of its major fuel sources is sugars, which the body gets from what is consumed as either simple sugar or complex carbohydrates. Of all the organs in the body, the brain depends on sugar (glucose) almost exclusively. The brain cannot make its own glucose and is 100% dependent on the rest of the body for its supply. If for some reason, the glucose level in the blood falls (or if the brain’s requirements increase and demands are not met) there can be effects on the function of the brain. Complex carbohydrates, found in vegetables and whole grains, help to avoid hypoglycemia by replenishing glucose at regular intervals. These foods take longer to digest, releasing nutrients into the blood stream gradually. This keeps the body’s energy constant. Refined carbohydrates absorb very rapidly into the bloodstream because little digestion is required. This causes a rapid increase in blood sugar levels, followed by an increase in the production of insulin, which removes sugar from the blood and results in a low level of blood sugar. A low blood sugar reaction can cause recurrent fatigue, irritability, tension, hyperactivity and aggression. These behavioral changes occur because the brain does not have the necessary nutrients to produce normal behavior. A child with low blood sugar feels miserable, and has difficulty learning. This can be avoided by providing a diet of complex carbohydrates found in vegetables and whole grains and be sure that the child eats them for breakfast, the most important meal of the school day. What can you tell us about the large-scale study of 200 hyperactive children that is mentioned on Page 38? Researchers at the University of Southampton studied over 1800 three-year-old children, some with and some without ADHD, some with and some without allergies. After initial behavioral testing, all of the children got one week of a diet without any artificial food colorings and without any chemical preservatives. The children’s behavior measurably improved during this week. But was this from the extra attention, from eating more fruits and vegetables, or from the absence of the preservatives and artificial colors? To answer this question, the researchers continued the diet, but gave the children disguised drinks containing either a mixture of artificial colorings and the preservative benzoate, or nothing – each for a week. The results were published in the June 2004 Archives of Diseases in Childhood. The weeks that children got the hidden colors and preservatives, their behavior was substantially worse. This held true whether or not they had been diagnosed with hyperactivity, and whether or not they had tested positive for allergies – good news for parents of 3 year olds everywhere! Can food allergies play a role in behavior and brain function? Some of what is known about allergies is that they have a significant impact upon a child’s performance. Some forms of hyperactivity, short attention span and mood swings are caused by allergies and intolerances for certain foods and other environmental factors. Allergies can also play havoc with a child’s ability to benefit from classroom instruction. For these reasons, when a child is diagnosed with learning problems and poor behavior, consideration should be given to the role that chemicals, stress, food allergies and other factors in the environment may be having upon the child’s performance. Now that we’ve discussed some of the issues surrounding nutrition, let’s talk about solutions. It’s easy to say, cut out this, substitute that and make sure your child is eating X, Y and Z. It’s not always easy putting it into practice. With families who are busy with work, school, and multiple extracurricular activities, how do we improve children’s diets without sacrificing a significant amount of time? Like all other things in life, one has to set priorities. I don’t think any busy mother has stopped to ask herself the question: “What is more important for my child, a well developed social life filled with extracurricular activities, or a healthy mind in a healthy body?” I have not encountered any research that concludes that a lack of extracurricular activities interfered with learning. Parents sometimes have to make these decisions for children based upon long term goals for the child’s future. In real life, a healthy brain in a healthy mind bodes more likely success than all the other activities combined. One approach might be a family meeting in which the effects of poor diet and nutrition are discussed. Agree upon and make a list of the foods the family should have then have each person assume responsibility for helping achieve the objectives. This would be a good time to learn to set priorities, to compare present benefits with future consequences. Some meals can be cooked the night before, use a slow cooker, prepare meals ahead of time and pop them in the microwave. And then slow down, way down the wisest people are calm and collected. Would you give up the social life if it had a direct, negative connection to your child’s hyperactivity? The book also mentions the negative impact of fast foods. Are there some fast food options that might be better than others? Not going to let you off the hook on that one. The healthiest fast foods I know are organically grown vegetables prepared the night or weekend before and popped in the microwave. Again it is a matter of priorities. A trip to the beach on a Saturday morning, or a few hours in the kitchen preparing next week’s fast foods. Some school systems have a wellness policy in place for their cafeterias. Should this be required in all school systems? For some children, the school cafeteria is their only source of health food. So yes, of course school cafeterias should have a wellness policy in place. In some schools the cafeteria produces health edible food. In other systems where food is mass produced and shipped to the schools, you have to read the menu to determine what you are about to eat. Often it is a disguised group of chemical additives that teachers and adults won’t eat. Yet, it is deemed ok for our children. How much of a difference can one good meal make to a child’s brain function? If you are going to give a child one good meal, make it a breakfast of whole grains, fruits and vegetables. These foods digest slowly giving the brain a steady supply of nutrients throughout the morning it will prevent hypoglycemia and all the associated symptomatic behaviors. On test day, this one meal can mean the difference between a diagnosis of learning disability, or average performance. That is why the school psychologist asks whether the child ate breakfast. If he did not, the test scores are invalid because you don’t have a measure of normal brain function. Any final advice for parents seeking to improve their child’s diet? Children can’t eat what you don’t buy. Substitute fresh fruit and popcorn for fatty snacks; filtered water for soda and other soft drinks containing caffeine sweetened with high fructose corn syrup or artificial sweeteners like aspartame, and don’t feed your kids foods that have things you can’t pronounce listed under ingredients. If it is not a natural food that you can visualize when you read it, don’t feed it to your kids. Children are precious commodities. Pretend that they are valuable antiques worth thousands of dollars. You will be more motivated to protect them by preventing the decline of brain function, allergies, and other damage done by the environment. Where should readers go if they want to know more about Learning Disabilities: Understanding the Problem and Managing the Challenges? 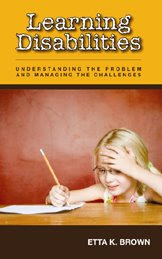 The book can be reviewed and purchased at www.understanding-learning-disabilities.com. The site also contains a lot of helpful information that is not included in the book. How can readers pick up a copy of the book? It will be in all major bookstores soon. Thank you for a second guest post on your blog. Thank you for spending so much time with us today. I’m thankful that someone took the time to write such a helpful book for parents. If you suspect your child has a learning disability or if an educator has suggested your child has a learning disability you’ll want to pick up a copy of Learning Disabilities: Understanding the Problem and Managing the Challenges by Etta K. Brown. A certified special education teacher, school social worker, school psychologist and Licensed Education Psychologist, Brown puts her twenty years of experience to excellent use in putting together a helpful and informative guide for parents who need to understand learning disabilities and the environmental influences that impact a child’s ability to learn. If only I had this book in my possession when I began the difficult process of having my daughter assessed, I would not only have done things differently, I would have been a better advocate for my child. I didn’t know the majority of the information found in the book, which is why I believe that every parent with a child who has been recommended for an assessment needs to read it before taking any step in that direction. In addition to the impact that diet and sleep have on brain function, the author discusses developmental readiness and how immature development may affect classroom performance. She spends time on the subject of retention and why it isn’t always the best solution. This book also covers how parenting, emotional trauma and toxic metals can affect development. After getting an understanding of learning disabilities and environmental influences that impact a child’s ability to learn, Brown moves on to a history of Special Education and provides an in-depth look at the entire process of determining eligibility, tests and testing, and the Individualized Education Plan (IEP). She is a strong proponent of parents acting as advocates for their children. The last section of the book shares signs and symptoms of learning disabilities and accomodations and modifications that can be made at home and school to provide the best enviroment for your child’s learning based upon the disability she is trying to manage. Learning Disabilities will empower parents to take an active role in their child’s education and provide them with the tools to be the best advocates for their child. I highly recommend Learning Disabilities by Etta K. Brown. Every school should have multiple copies on hand to assist parents with the process.